1. Altar. 2. Evangalion. 3 + 7. Mar Toma Sliba 4+5 Bet Gazze. 6. Tabernacle. 8. Madbha. 9. Sanctuary lamb 10. Seats for Ministers. 11. Sanctuary Veil. 12. Qestroma. 13. Steps to Sanctuary. 14. Step to Qestroma. 15. Bema. 16. Haikla 17. Sacristy. 18. Bet-Sahde. 19. Baptistry 20. Doors. 21. Lamps. 22. Lectern for Engarta 23. Lectern for Qerjane 24. Veranda. There are special places for special objectives. Schools for study, Hospitals for treatment, Library for reading books, play grounds for playing and so on. 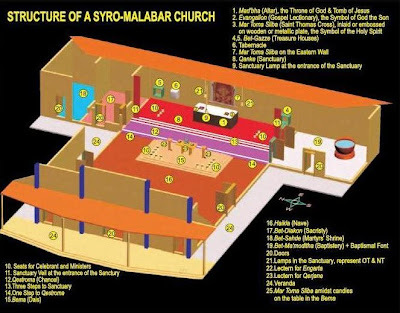 Madbha (Sanctuary) is the most elevated and important space inside the Church. It is the heaven on earth. The altar is erected in its centre nearer to the eastern wall. means the empty tomb, namely, the tomb of Risen Lord. In short, the Altar is the Image of the Risen Lord. The Syriac word Misha means “the anointed one”. During the consecration of an altar, the altar is completely anointed with holy oil in order to proclaim the reality that it is the Icon or Image of Iso’-Misha himself. Sornos: Aged Mar Toma Nazranees of traditional training call the altar, “SORNOS”. It is the Malayalam rendering of Tronos, the Greek word that reached them through Syriac. Tronos in Greek and in Syriac means the “throne”. Thus altar is the throne of God in the Madbha, which is, in fact, the heaven on earth. In the Symbol of Faith (Creed), we proclaim that we believe “in one Lord ... ascended into heaven, and sits at the right hand of his Father”. The very same fact we proclaim by action when the Gospel Lectionary (Evangalion) is enthroned solemnly on the right hand side of the Altar. Evangalion: Evangalion, i.e., the Gospel Lectionary, represents the risen Lord. It includes only the Gospel pericopes, proclaimed in the Liturgy and it is taken out of the Madbha only for proclaiming it in the Liturgy or for carrying it in procession. Whenever it is to be taken out, it is done only with the accompaniment of lighted candles, incense and so on. Mar Toma Sliba: Mar Toma Sliba is placed or enthroned on the left hand side of the altar. Symbolism of Mar Toma Sliba has already been described. It is also the Image of God the Holy Spirit, since the resurrection of our Lord happened by the work of the Holy Spirit. Hence the altar for a Mar Toma Nazranee is the throne of God: he or she sees the Father seated in the centre, the Son on the right and the Holy Spirit on the left. A priest who solemnly approaches the altar to celebrate the mysteries, kisses it first in the centre, then on the right and again on the left in order to confess the Trinitarian economy of salvation. A Mar Toma Sliba of bigger and proportionate size is fixed at the centre of the eastern wall in the Sanctuary. Bet-Gazza: The Bet-Gazze, “Treasuries” are arranged on both sides of the altar. Usually they are made as niches or recesses in the eastern wall itself or the northern and southern walls of the sanctuary. They are places for preparing the Eucharistic gifts. The chalice is prepared in the bet-Gazza on the southern side and paten in that on the northern side. If properly arranged, the bet-Gazza on the northern side could be used to preserve the Holy Body of our Lord. But today usually a tabernacle is arranged near the northern bet-Gazza to preserve the Holy Eucharist. Sanctuary Veil: There must be an opaque veil in all churches of Mar Toma Nazranees. It separates the Sanctuary from other parts of the church. Generally, the Sanctuary is kept veiled. It is, in fact, a proclamation of our faith in heaven, which is beyond our ordinary human perception. It is during liturgical celebrations that we are given an experience of heaven. Hence the sanctuary is opened at determined times during such celebrations. Sanctuary Lamp: At the entrance of the sanctuary, there must be a lamp. Usually it is hung from the roof of the sanctuary and lit always as a sign of the presence of God in the sanctuary, which is heaven on earth. Qestroma, “Chancel”, is the space in between the Sanctuary and the nave. It is made three steps below the sanctuary but one step higher than the nave. Traditionally, it is the place for the trained Choir. According to the directives given in the recently approved Order of the Raza, the Bema table, where the first part of the Liturgy is conducted, could be well arranged in the Qestroma. Haikla, the “Nave,” is the spacious place for the community at the western portion of the church. Symbolically it is the earth, the place for the lower or earthly choir in the Liturgy. Bema: Bema, the “Dais”, is a raised platform in the middle of the nave. There must also be a table on it. The table is the symbol of Calvary and the platform (Bema), itself of earthly Jerusalem. There must be a Mar Toma Sliba on this table and candles or lamps on either side of it. Candles or lamps symbolize the Old and New Testaments. On either side of the table on the Bema lecterns are arranged for Old Testament readings (Qeryana) and the Epistle (Enggarta). The Epistle is read from the lectern on the north and the Old Testament readings from that on the south. for the celebration of Baptism are arranged in this particular space. Baptistry must be accessible also from the Sanctuary. Rites exclusive for Baptism are conducted in the Baptistry. Sacristy is the place where the priests and other ministers vest themselves for liturgical rites. Usually it is built on the northern side of the sanctuary, having possibility of direct entrance to it. Bet-Sahde is a convenient place or room, usually adjacent to the Sacristy, where the relics of the saints are venerated. It was in fact the burial place for saintly priests and bishops. The people began to come together there and seek their help and mediation. Slowly the community began to deposit there the relics they got from other Churches. Thus it became a place of saints’ veneration. In the present day context, the cemetery chapel itself could be very well so arranged. The Mar Toma Nazranees would better express their respect and veneration to saints and martyrs relating it to this special place and not associating it to the church itself as it is in the Latin tradition.